The Manchester Arena is an indoor arena situated in Manchester, England. The arena is situated on Hunts Bank and is connected to Manchester Victoria station. The arena opened in 1995 sponsored by NYNEX CableComms as the NYNEX Arena and was renamed the Manchester Evening News Arena in 1998. The Manchester Evening News ended its 13 year sponsorship at the end of 2011 and the arena was renamed the Manchester Arena in 2012. The Manchester arena is amongst the largest indoor arenas in the European Union with a capacity of 21,000 and is one of the world's busiest indoor arenas, hosting music and sporting events such as boxing and swimming.The arena was a key part of Manchester's bids to host the Olympic Games in 1996 and 2000 and was eventually used for the 2002 Commonwealth Games. The Manchester Arena was constructed as part of the city's unsuccessful bid for the 2000 Summer Olympics. Construction cost 52 million pounds of which 35.5m pounds was provided by government grants and 2.5m pounds from the European Regional Development Fund. Although built as an American style sports arena it has been more successful hosting large music events. On the opening night, 15,000 spectators watched Jayne Torvill and Christopher Dean perform; the crowd was a record for an ice event. Attendance records were set in 1997 when 17,425 people watched Manchester Storm play Sheffield Steelers, a record for an ice hockey match in Europe. When 14,151 people watched Manchester Giants play London Leopards, it set a British record for attendance at a basketball match. The venue attracts over a million customers each year for concerts and family shows, making it one of the world's busiest indoor arenas, and was named "International Venue Of The Year" in 2002 in the 'Pollstar' awards, and was nominated in the same category in 2002, 2003, 2004, 2005, 2006, 2007, 2008 and 2009. The arena was named "Busiest Arena Venue In The World", based on ticket sales for concerts in 2003, 2004, 2005, 2006 and 2007 ahead of other indoor arenas including the Madison Square Garden and Wembley Arena. The arena was the 'World's Busiest Arena' from 2001 until 2007 based on ticket sales for concerts, attracting five and a half million customers. It was voted 'Europe's Favourite Arena' at the TIP Awards in 2008 by the touring companies that bring the shows to the venue. 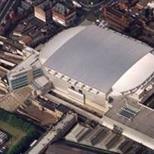 In 2008, the arena was world's third busiest arena behind London's O2 Arena and New York's Madison Square Garden. In 2009, it was the world's second busiest arena behind London's O2 Arena and ahead of Antwerp's Sportpaleis and Madison Square Garden. Although second to London's O2 Arena the Manchester Arena had its busiest year with over 1,500,000 people attending concerts and family shows. The arena hosts over 250 events annually including comedy, live music and tours, sporting events, and occasionally musicals. If travelling by car, the Manchester Arena is situated on the A56, 3 miles from Junction 17 of the M62. The Manchester Arena is located in the City Centre, on the corner of Trinity Way, Hunts Bank and Great Ducie Street, and is adjacent to Victoria Station. For Sat Nav systems the postcode is M3 1AR. For cheaper, easier travel to Manchester Arena events and back, pre-book a cab by visiting https://www.minicabit.com. Many buses serve Cannon Street and Victoria bus stations and many more stop within easy walking distance in the city centre. If you're staying out late then Nightbus services on Friday and Saturday nights run directly past the Manchester Arena. Manchester's free city centre Metroshuttle service also links Victoria station with other areas of the centre. The on-site multi-storey car park is operated and managed by NCP Manchester and has a capacity of 900. In addition, approximately 3,500 recognised NCP spaces within 10 minutes walk serve the Manchester Arena. Please beware of unauthorised car parks and street parking. They advise anyone with walking difficulties to arrive as early as possible and use the NCP car parks at the Arena, Shudehill or the Printworks. They have a number of areas within the auditorium that offer access to wheelchair users and their companions. For more information or to book tickets please call the Accessibility line on 0161 950 5229. There is a loop system fitted into disabled platform 105. The arena does allow guide dogs. You need to contact them to arrange this before going to an event. You can contact the Accessibility co-ordinator for information and bookings by telephone on 0161 950 5229, by fax 0161 950 6008 or email specialneeds@smg-europe.com.